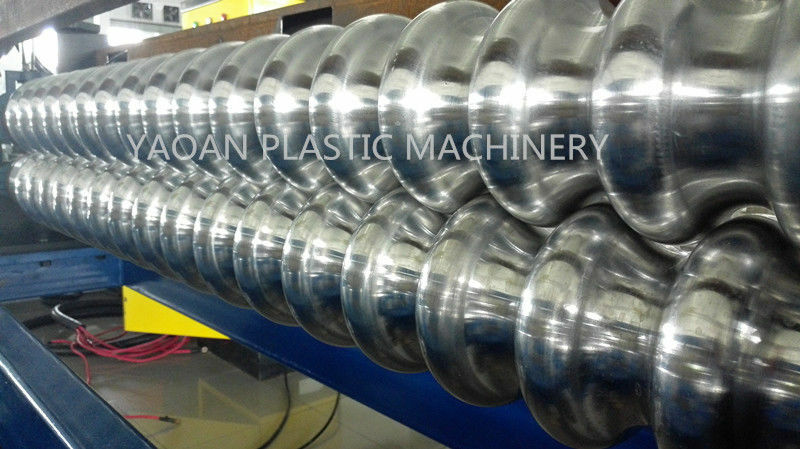 Extruder: twin screw design, according to different requirement from customer, we can manufacture extruder for PP,PE or PC wave roof sheet. Screw&barrel: guarantee excellent plasticizing effect and stable,high speed extrusion. Low-noise wind cooling system, closed barrel design has good heat conduction and heat emitting. Gear box: adopts soundproof design for gear box, the gear has been experienced hardening treatment, with forced lubrication system,which assure running under low-noise. Filter screen changer: double filter screen changer assure easy operation. Forming unit: its suitable design ensures quick forming, exact size of sheet..
Haul-off unit: it is of simple two-roller take-up design, clearance can be freely adjusted, it adopts frequncy conversion speed control,, which ensures various extrusion speed and stable running.